Dr. Michael D. Perry, an ordained minister, received an Honorary Degree of Doctor of Divinity in 2009 from Christ Resurrection Ministries in recognition of his thirty-seven years in Christian ministry as a pastoral teacher. Marking forty years in ministry in 2012, he has been a pastor-teacher in various churches in various denominations. Dr. Perry has taught over seven hundred home Bible studies. He has written several hundred teaching papers on various Biblical topics. He has also written a book on Bible prophecy entitled Virtual God and the Prophetic Power Wranglers. While working with men recovering from drug addiction, he wrote this study guide to help them become witnesses for Jesus. This study guide is written on an eighth grade level and covers the entire Book of Acts (Acts of the Apostles) from the King James Version of the Bible. 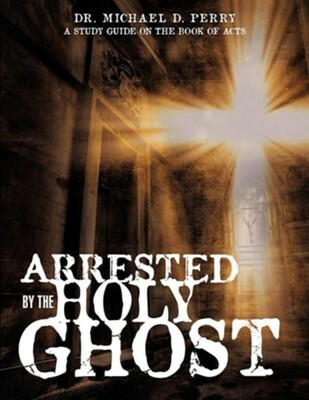 Acts 1:1 - "The former treatise have I made, O Theophilus, of all that Jesus began both to do and teach..."
I'm the author/artist and I want to review Arrested by the Holy Ghost, Paper.